I am a Toucan and I live in a very warm country. See my handsome black coat and my yellow vest. My toes are like a parrot’s, two in front and two behind. They help me to hold to the limbs. Look at my large beak. It looks heavy but it is not, as it is filled with air cells. These make it very light. Do you like my blue eyes? My nest is very hard to find. If I tell you where it is, you will not take the eggs, will you? It is in a hollow limb of a very high tree. I am very fond of fruit, and for this reason the people on the plantations do not like me very well. I can fly very fast, but I cannot get along so well on the ground. I keep my feet far apart and hop. I like to sit in the top of the tallest trees. Then I am not afraid. Nothing can reach me there but a rifle ball. I do not like the owl, he is so ugly. When we find an owl we get in a circle around him and snap our great beaks, and jerk our tails up and down and scream. He is very much afraid of us. The people where I live like our yellow breasts. They wear them on their heads, and also put them on the ends of their bows. I think it is a pretty song, but the people do not like it very much. The flight of these birds is easy and graceful, sweeping with facility over the loftiest trees of their native forests, their strangely developed bills being no encumbrance to them, replete as they are with a tissue of air-filled cells rendering them very light and even buoyant. On the ground they get along with a rather awkward hopping movement, their legs being kept widely apart. In ascending a tree they do not climb but mount from one branch to another with a series of jumps, ascending to the tops of the very loftiest trees, safe from every missile except a rifle ball. They have a habit of sitting on the branches in flocks, lifting their bills, clattering them together, and shouting hoarsely all the while, from which custom the natives call them Preacher-birds. Sometimes the whole party, including the sentinel, set up a simultaneous yell so deafeningly loud that it can be heard a mile. They are very loquacious birds and are often discovered through their perpetual chattering. Their cry resembles the word “Tucano,” which has given origin to the peculiar name. When settling itself to sleep, the Toucan packs itself up in a very systematic manner, supporting its huge beak by resting it on its back, and tucking it completely among the feathers, while it doubles its tail across its back just as if it moved on hinges. So completely is the large bill hidden among the feathers, that hardly a trace of it is visible in spite of its great size and bright color, so that the bird when sleeping looks like a great ball of loose feathers. Sir R. Owen concludes that the large beak is of service in masticating food compensating for the absence of any grinding structures in the intestinal tract. Today the Yellow Throated Toucan is also referred to as the Black-mandibled Toucan, at least by the IOC list of World Birds and the Internet Bird Collection. 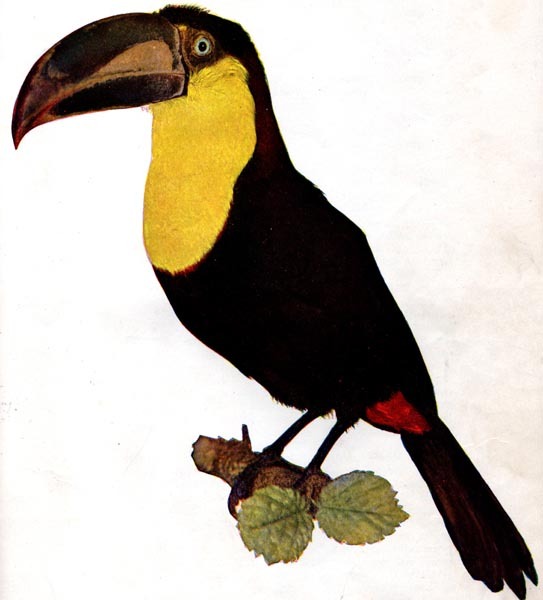 Actually, there are several Toucans that have a yellow throat and hope this is the one referred to in the 1897 article. The way they keep changing the names and splitting the species, the Chestnut-mandibled is also in that species. What a fantastic bird and such an amazing creation from the Lord. Such a beautiful beak and yet so light. Toucans are members of the family Ramphastidae of near passerine birds from the Neotropics. The Ramphastidae family is most closely related to the American barbets. They are brightly marked and have large, often colorful bills. The family includes five genera and about forty different species. The name of this bird group is derived from the Tupi word tukana, via Portuguese. Toucans range in size from the Lettered Aracari (Pteroglossus inscriptus), at 130 g (4.6 oz) and 29 cm (11.5 inches), to the Toco Toucan (Ramphastos toco), at 680 g (1.5 lb) and 63 cm (29 inches). Their bodies are short (of comparable size to a crow’s) and compact. The tail is rounded and varies in length, from half the length to the whole length of the body. The neck is short and thick. The wings are small, as they are forest-dwelling birds who only need to travel short distances, and are often of about the same span as the bill-tip-to-tail-tip measurements of the bird. The colourful and large bill, which in some large species measures more than half the length of the body, is the hallmark of toucans. Despite its size, the toucan is very light, being composed of bone struts filled with spongy tissue of keratin between them. 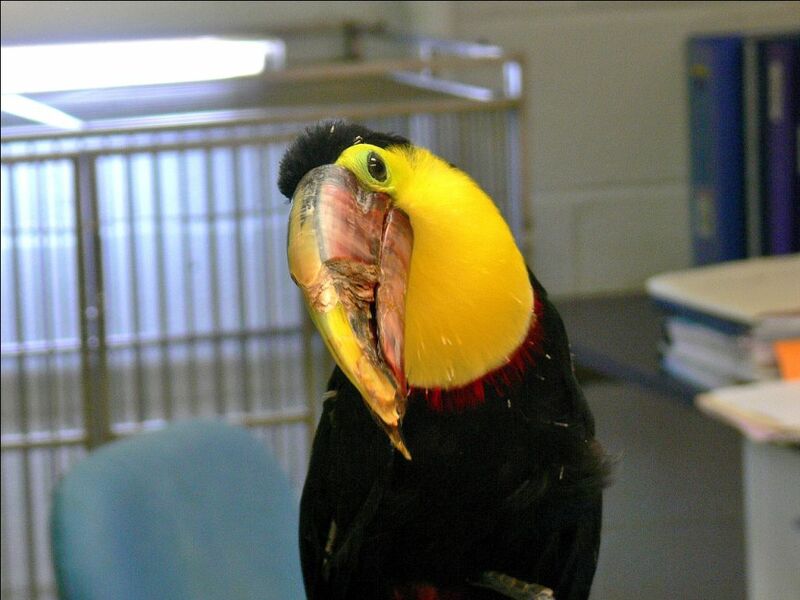 The bill has forward-facing serrations resembling teeth, which historically led naturalists to believe that toucans captured fish and were primarily carnivorous; today it is known that they eat mostly fruit. 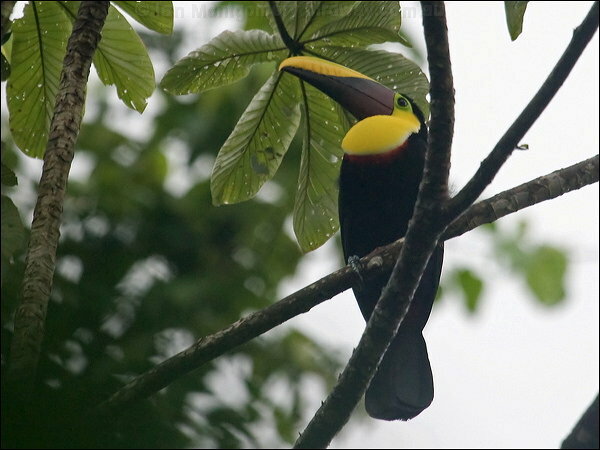 Researchers have discovered that the large bill of the toucan is a highly efficient thermoregulation system, though its size may still be advantageous in other ways. It does aid in their feeding behavior (as they sit in one spot and reach for all fruit in range, thereby reducing energy expenditure), and it has also been theorized that the bill may intimidate smaller birds, so that the toucan may plunder nests undisturbed. Also, the beak allows the bird to reach deep into tree-holes to access food unavailable to other birds, and also to ransack suspended nests built by smaller birds. However, as there is no sexual dimorphism in coloration it is unlikely to be a sexual signal. A toucan’s tongue is long (up to 14–15 cm, or 6 inches), narrow, grey, and singularly frayed on each side, adding to its sensitivity as an organ of taste. A structural complex probably unique to toucans involves the modification of several tail vertebrae. The rear three vertebrae are fused and attached to the spine by a ball and socket joint. 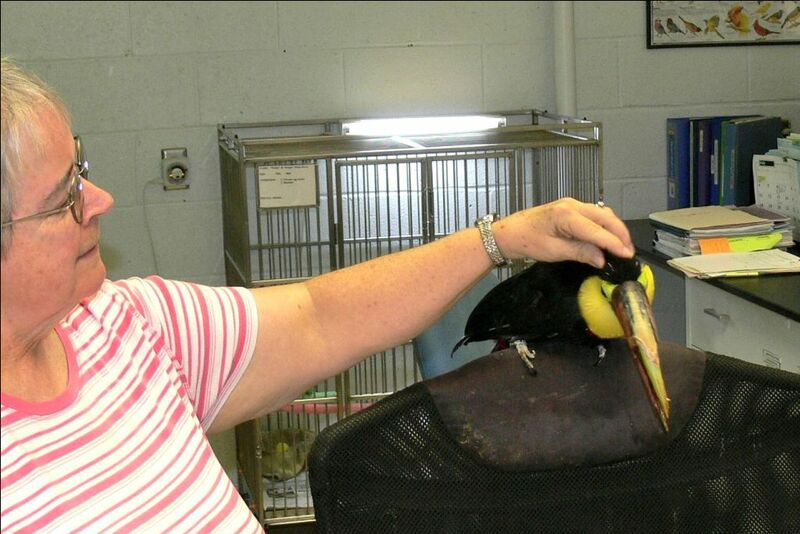 Because of this, toucans may snap their tail forwards until it touches the head. This is the posture in which they sleep, often appearing simply as a ball of feathers, with the tip of the tail sticking out over the head. Toucans are primarily frugivorous (fruit eating), but are opportunistically omnivorous and will take prey such as insects and small lizards. Captive toucans have been reported to actively hunt insects in their cages, and it is possible to keep toucans on an insect-only diet. They also plunder nests of smaller birds, taking eggs and nestlings. This probably provides a crucial addition of protein to their diet. However, in their range, toucans are the dominant frugivores, and as such play an extremely important ecological role as vectors for seed dispersal of fruiting trees. Often when eating small fruits, toucans will throw their heads back and allow the fruit to roll into their throats before swallowing. 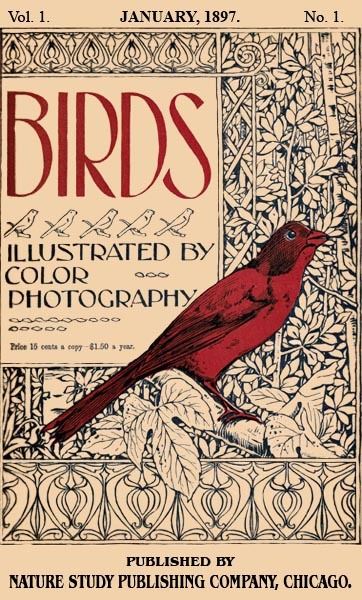 The above article is the second article in the monthly serial that was started in January 1897 “designed to promote Knowledge of Bird-Live.” These include Color Photography, as they call them, today they are drawings. There are at least three Volumes that have been digitized by Project Gutenberg. This entry was posted in Birds, Kid's Section and tagged Birds Illustrated by Color Photography, Birdwatching, Christian, From The Past, Home School, Kids, Ramphastidae, Toucan, Vol 1 #1 January 1897, Youth. Bookmark the permalink.